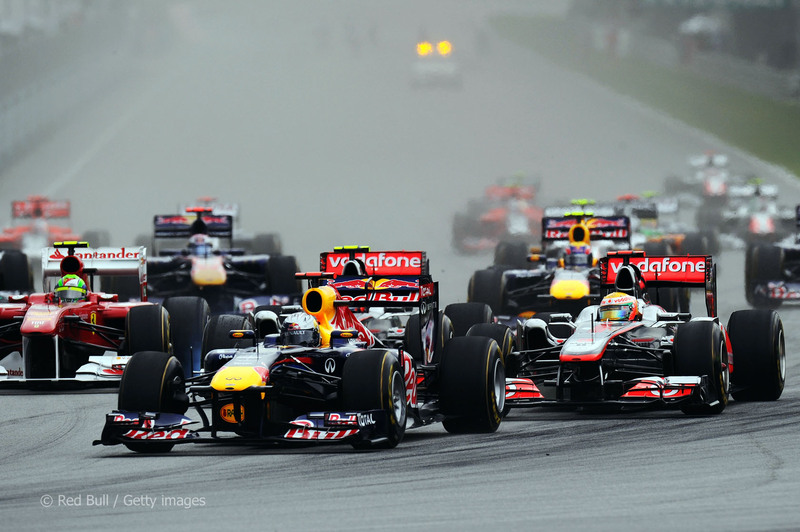 The Malaysian GP is over and we have seen another Red Bull win at the hands of Sebastian Vettel. In fact that is his 4th win in a row counting Brazil and Abu Dhabi last year. It was kind of what a lot of people expected but it turned out to be a lot closer than it was in Australia. Proven by the margins in qualifying. It was said that Red Bull would need KERS in Malaysia and they supposedly had it on the car in qualifying. And yet there was only 1 tenth between Vettel and Hamilton in the end. I had predicted Webber would be up to speed in Malaysia and it was certainly less of a margin than in Oz. But 3 tenths behind pole position gave him 3rd on the grid again. Jenson came close within the blink of an eye to that 3rd position but lined up 4th ahead of Alonso that was 1 second down on the pole time. The lights go out and Vettel gets a good start and takes the inside line to defend his position. With the much longer run down to turn 1, his KERS must be functional. Mark Webber on the other hand is in all kinds of trouble. His KERS was not working and that coupled with a bad start results in cars passing him left and right. He finds himself in 11th on the first lap. “Well as we all do, I have watched the footage from the last five years here and the inside line has always the best into Turn One so it was my aim to get to the inside as quick as possible. I even had a little go at Lewis down the inside and then I heard an almighty racket down the outside and it was the two Lotus Renault GPs”. Almighty racket.. Awesome. I can only imagine because those Lotus Renaults have a very distinct sound due to their forward exhaust system. Especially when they lift off the burble the car makes is both significant and loud. Petrov slots in 5th ahead of both the Ferraris this time. That made me snicker as I watched two Ferraris getting Petroved this time. Unfortunately this was shortlived as The Russian made a mistake and went wide on lap 6, letting both Ferraris by. Further down the field there are plenty of scraps going on. Webber and Kobayashi is one. Webber gets by the Japanese driver but Kobayashi uses his KERS and DRS on the straight to pass him right back. Eventually Webber pits for new tires as the first driver to do so. This time we see the battle of Kobayashi and Schumacher. Schumacher passes him, Kobayashi comes back. And so it goes for several laps. It was in fact one the best back and forth battles I can remember in a long long time. And I wish we could have seen every bit of it. I guess we have to give credit to KERS and the DRS on the rear wing for that. Some of you folks may find it artificial, but so far its been pretty good fun from where I’m sitting. Also – Koba is one cool dude. He takes the fight to whoever. Alonso, Schumacher, Button – any world champion doesnt intimidate him. Nor that he is in inferior kit. He is a racer, through and through. One of the greatest moments from the race though, was when Hamilton, Schumacher and Buemi are 3 wide down the back straight. I literally shouted with glee seeing that on my screen. Loved it! Encore! There was so much going on from this point that I actually have real trouble remembering it all. And I would have to study the race footage to get all the details right. So I will just touch on a few highlights.Hamilton is chasing Vettel down after passing Heidfeld in the pits. At that point it looked like a certain 2nd place for Hamilton – if not even a fight for the win. But that was not to be. Those Pirelli tires are fickle and it appears that one less than perfect strategy call can make or break a race. As we could see in Hamiltons case. I suspect that it also has to do with his driving style that wears more on the tires. To add to that is that early in the race it seemed like Button was going to end up far down the order. But he noticed a problem with the setup, asked the team to correct it and his pace gradually got better. Also helped by his great stint on the hards where he said the car came alive. In the end he was the one taking 2nd place. That tells a story that the races are going to be more unpredictable than – well, as far as I can remember anyway. Vettel and Red Bull on the other hand seemed to be completely on top of things. We hear them over the team radio speaking of “Phase 2 and “Plan B”. It all seems very calm and calculated. Even when he was told that he cannot use the KERS, he is calm and just asks the team to confirm the message. The weird thing is that after this he ups his pace tremendously and sets the fastest laps pulling away from his competitors. The thought that struck me then was that Red Bull was just playing mind games with their rivals as they knew that they would hear that message. But I dunno, just a thought. The two former teammates were having a great scrap for 3rd place towards the end of the race. Unfortunately it ended prematurely due to Alonsos mistake by driving into the back of Hamilton, losing a big part of the Ferraris front wing. He got to close and did not account for Lewis taking a slightly defensive line and – bang, damage done. A racing incident clearly, but both drivers were surprisingly both hit with 20 second penalties after the race by the stewards. Hamilton for changing his defensive line to many times on the straight and Alonso for slamming into the back of the McLaren. This is what I dont get. Last year we were told that the drivers would be allowed to race and they would ease off the penalties. But this looked unnecessary to me. I didnt see Hamilton weaving that much but perhaps I didnt see it on the screen. 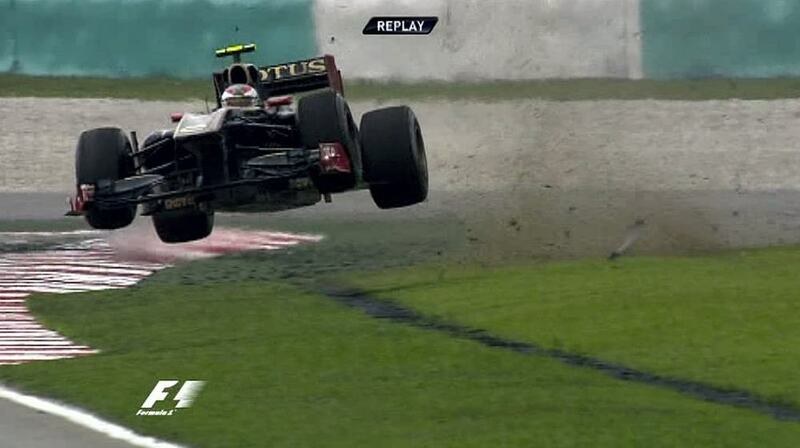 And Alonso made a mistake, sure, but to penalize him? Well, he didnt lose any positions so maybe that was accounted for. But Lewis did drop a place. Oh well. Moving on. Vettel crosses the line victorious, never really challenged by anyone. And this with a KERS that was working on and off. The boy is in the shape of his life and the mistakes seems like only shadows of the past now. He shows off his index finger to the world and doesnt look fazed or tired at all.Webber does a great recovery to 4th considering a faulty KERS and a 4 stop strategy. The car has got some serious speed even with the dead weight of the KERS system on board. Button gets a well deserved second. I believe the nature of the Pirellis are playing strongly into his hand and driving style. I expect strong finishes and perhaps even a win from him this year. Hamilton will bounce back and McLaren have an extremely aggressive development strategy lined up for their car. They are hell-bent on catching up with the RB7. It may be a tall order but big kudos for the determination. It aint over til its over. What about the Ferrari. 5th and 6th place is where they placed and also where they seem to be in relative car performance. But Alonsos skills will probably often get him into a position where he can challenge for a podium. It has to be a 8.5 out of 10. I was on my toes for most of the race, unsure of the result and highly entertained by all the fights on the track. The new regulations and tires has so far added greatly to the spectacle. If we had a great scrap for the lead, the score would have been higher. 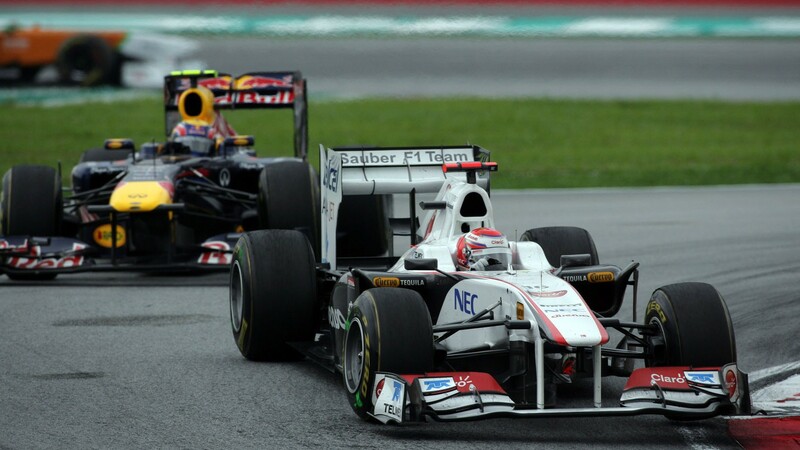 Button is a real candidate as he corrected a problem and preserved the tires well and got the best result possible that day. Heidfeld that fought off a charging Webber at the end of the race to keep his 3rd place certainly deserves a mention. 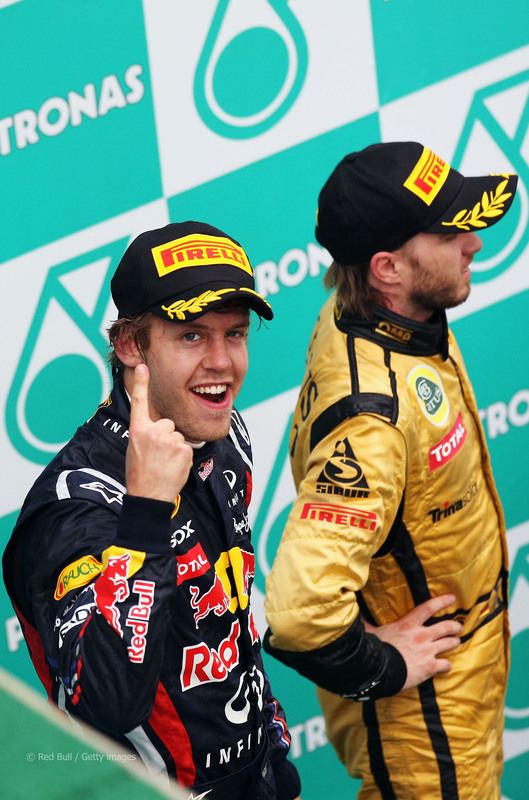 But it still is Mr. Vettel that impressed me the most. It may have looked easy because he was leading for most of the race. But it takes a calm head to not overdrive or feel pressured by a closing car while feeling the tires starting to fade under him. He was one cool customer and no win is easy. Well done. That, I’m afraid goes to Petrov. While his imitation of Jurij Gagarin was awesome as he took flight, it was rather naive of him to keep his foot down over the grass. If he had lifted as he went wide he might have been able to get it back on the track even if he would have lost one place to Hamilton. Now there is a Lotus Renault in shambles that has to be checked for cracks in the chassis and probably totally rebuilt for China. His mechanics are not too happy I can imagine. Both by user TommyB89 on the Atlas forum. Have an awesome easter folks, and see you on the track.